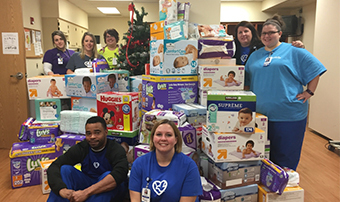 Methodist has again partnered with Channel 94.1 for the annual Diaper Drive. This is a community initiative to stock the shelves with diapers at the Lydia House to help mothers in need. This year they hope to collect enough diapers to fill several semi trucks. This Diaper Drive will run from Friday, Dec. 14 through Sunday, Dec. 16. Drop off diapers at the Linden Market Hy-Vee on 132nd and West Dodge Road. Methodist will not be hosting collection sites at our facilities for the drive. Employees who would like to contribute may do so directly. Questions regarding participation in the Diaper Drive may be directed to Tanya Patry in Marketing at tanya.patry@nmhs.org. For Diaper Drive details on the Channel 94.1 website, click here.